Imagine my delight with my Vindaloo surprise made by my Yarn Garden on-line friend Kaite who is from Bathurst NSW! It is absolutely delightful – my colours, the colours that comes from Vindaloo spices, AND it falls beautifully on my wrist. Kaite’s construction was guided by the book “Beaded Treasures” by Robin Atkins. 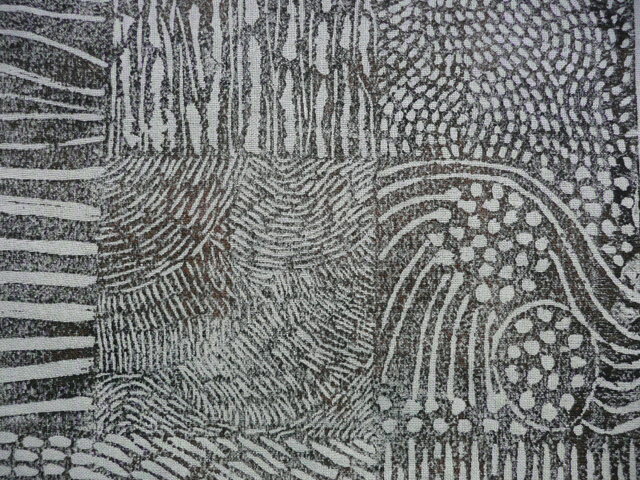 This is one of Robin’s beautiful books focussed on rather innovative beading techniques. There is a different beautiful example on the Yarn Garden website, if you care to click on this from my favourite blogs. I am sure you will enjoy taking a peek. You know how something appeals to you, and you don’t really know why? The idea just seems to stick inside your mind? Life is such a journey. 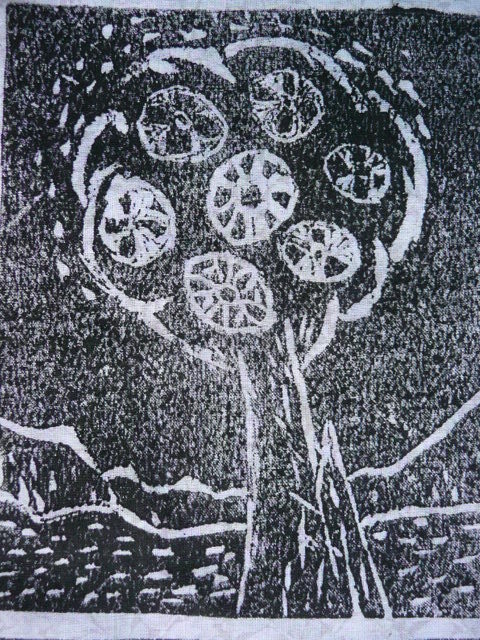 I have done linocutting before – at a 2-day workshop, but I wasnt that thrilled with the overall effect and the stiffness of the end product. 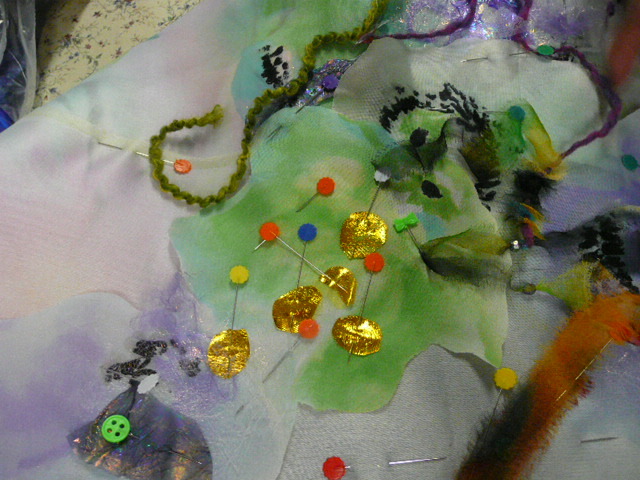 Maybe that deep-seated dissatisfaction is why I wanted to take this technique further and become more familiar with its possibilities for fabric-art. Well with the new year here, I dived in! 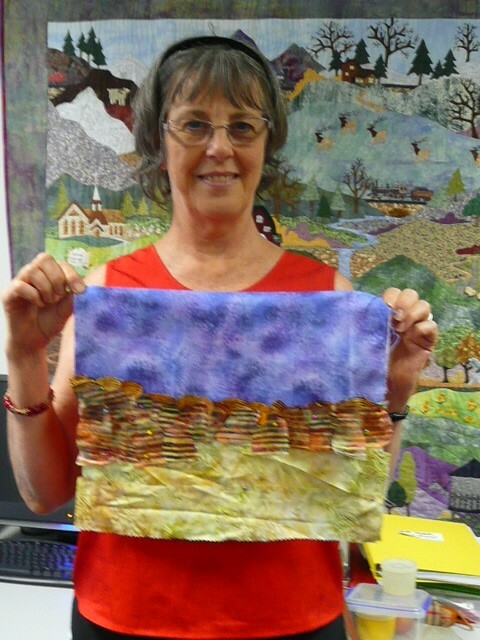 I enrolled for Dijanne Cevall’s on-line class – the timing was right! 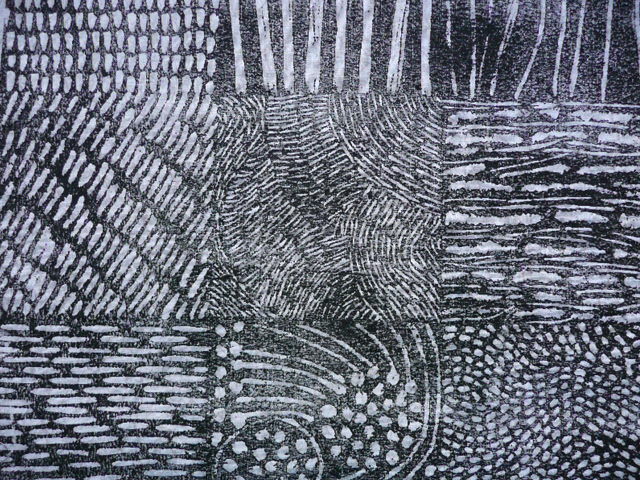 Bought myself some decent tools, lino, paints, and locked myself away for a couple of days. Look what has transpired from my first lesson. I am pleased with the outcome. No time for housework – it’s time to get working on lesson 2. This is so exciting. I hope you come back and see these results. 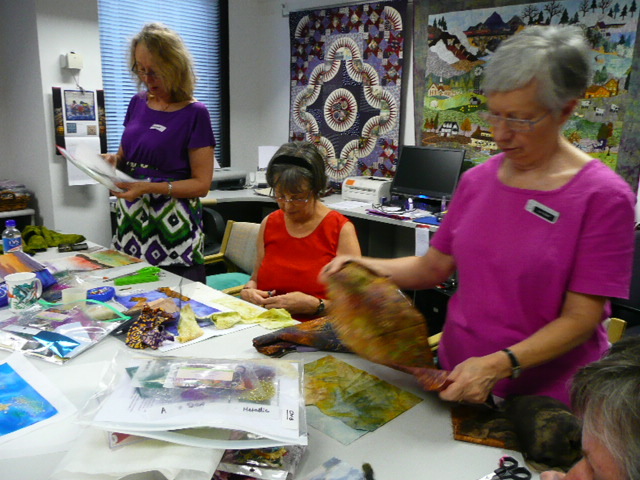 Teaching assignment for Quilters’ Guild of NSW Inc.
Held in the Guild’s office – Pitt St, Sydney – on 6/2/10 – we all had a very creative day. Playing with Angelina, Crystalina, Metallic Foils sparked off these creative minds. Starting this workshop was all GO GO GO! Their enthusiasm to discover what goodies were in the kit that I provided for them nearly overshot the runway!!! We launched into these intriguing products, learnt how to apply them and the differences between standard, metallic, hotfix fibres. They impressed me with how readily they dived into applying these products into either a landscape or abstract piece of art. The day ended with lots of smiles and a bag full of good work to finish at home. 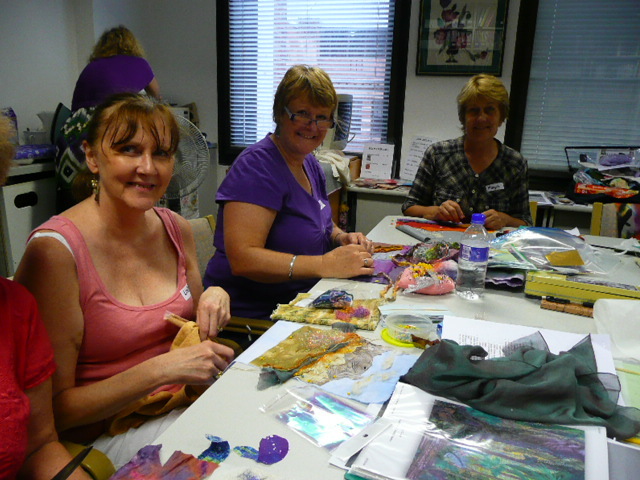 This one-day workshop was a great activity and I can’t wait to see where these ladies take their adventures with these fibres and foils. Come & Learn about Angelina, Crystalina, Shiva Stiks, Metallic Foils, Swarovski Hotfix Crystals? On Saturday (yes Saturday when you are all free) the 27th of this month, I am teaching the use of all these wonderful products – and not only that – how to incorporate these into a miniature art-quilt. These fabric art-quilts are a really cool gift to send someone in the mail or as a little piece of original art to hang on your wall. 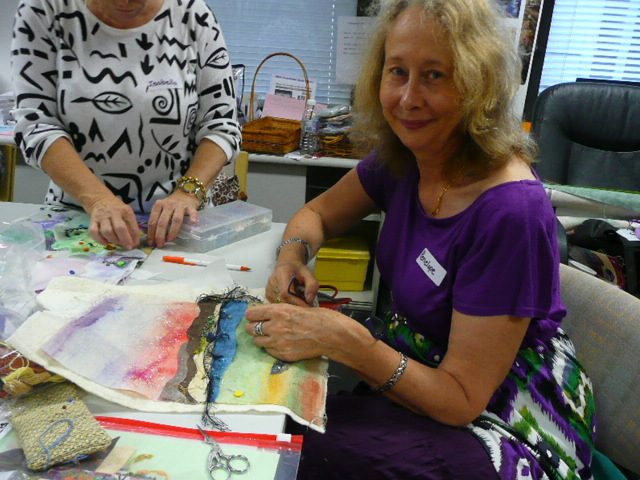 My CREATING LAYERS WORKSHOP is held at the Craftmailbox office – situated at 4/17 Green Street, Banksmeadow (Botany) NSW 2019. it is very easy to get there, being just off the freeway near the airport. There is ample parking close-by and you don’t have to bring much as the lovely craftmailbox ladies will have a kit available to make it an easy day. Here is a sample showing you what will be accomplished – am I inspiring you to join us for the day? 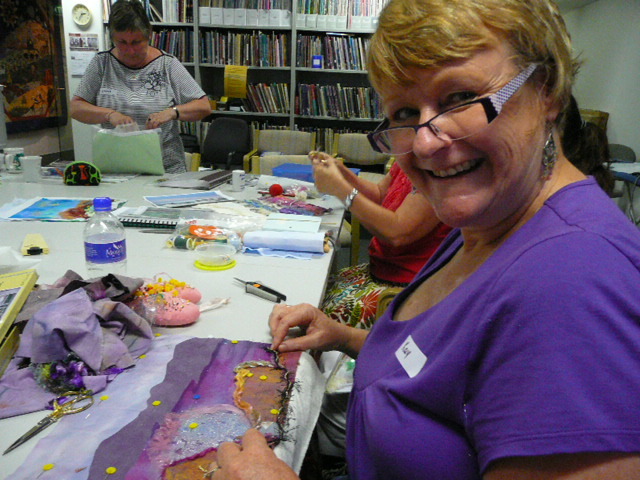 Be assured you will learn lots, play heaps, create max, and take home an enchanting piece of textile art. 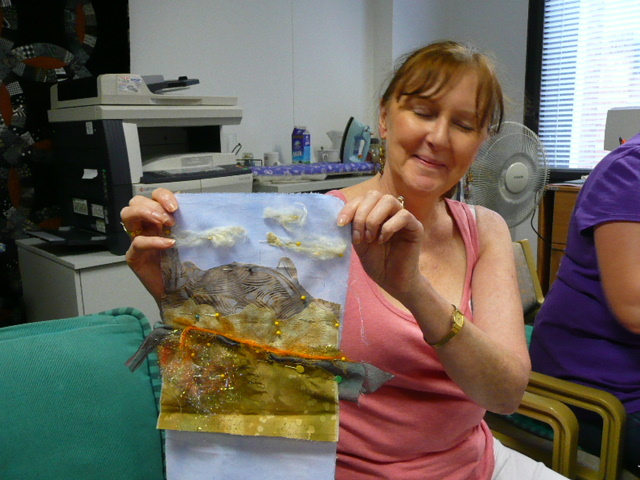 Do come along and play – if you have been wondering how to use these new products, this is a great opportunity to dabble and experiment – and create a beautiful piece of fabric art. Beading is an enchanting activity – I find it very soothing for the soul and calming to my nature. My purchase of a delightful book authored by Robin Atkins ” Heart to Hands Bead Embroidery” provides fresh ideas and techniques for creating art with beads – this rekindled my wish to bead. AND….I joined an on-line challenge with the Beading Journal Project. 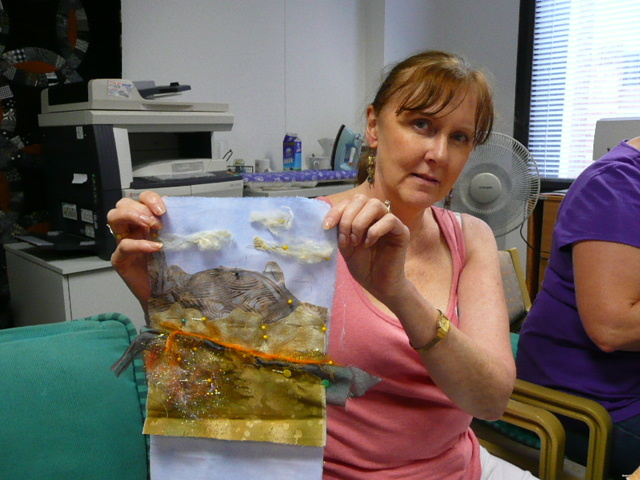 Each month we produce one beaded piece of work. 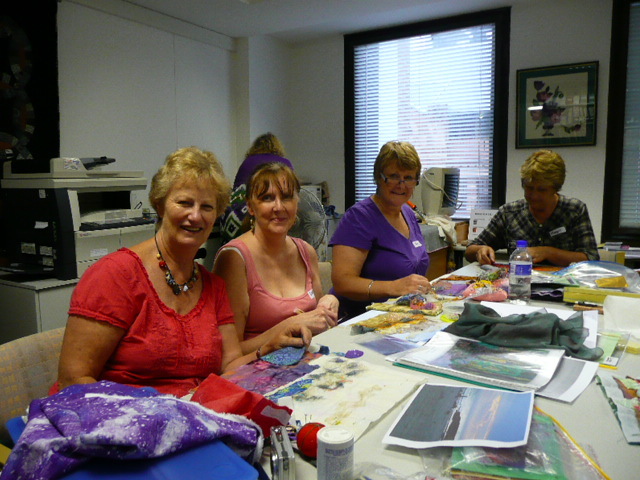 The challenge is with ourselves, to create something new or different with the aim of developing beading skill and ability, and of course to enjoy doing this work and sharing with fellow members of this group. The one and only “rule” is that I had to decide on a particular size or mode to focus each monthly challenge – I selected Postcards for my monthly challenge. 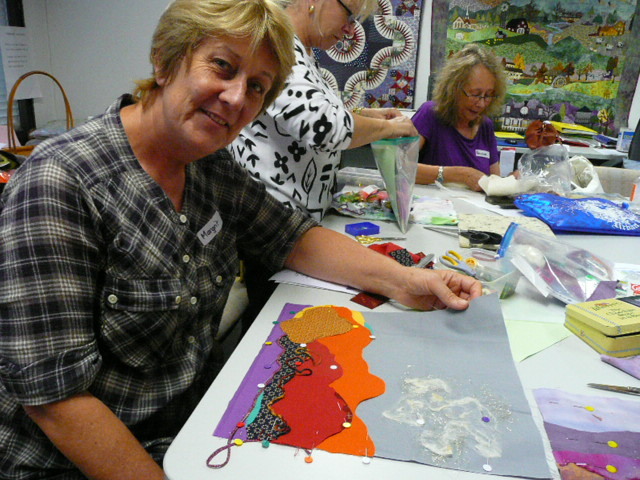 January was a busy month as I was busy organising a workshop program for ATASDA NSW group – 20 exciting workshops in fact! Details will soon be available on the ATASDA website to whet the creative appetites of members and interested non-members. As a result of this time restriction for my challenge, I made two postcards using similar beads and an ad hoc approach to the beading. 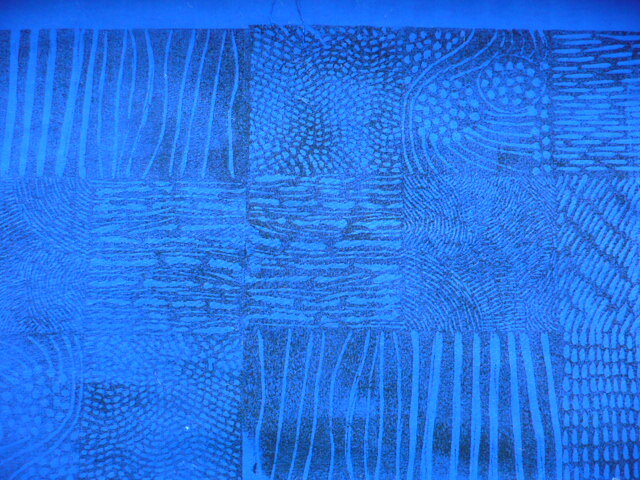 The background was created by stamped acryilic paint, silk and cotton fabrics, and self-made fabric from yarns sewn on Solvy, before the addition of simple beading to provide a focal point of interest. I can’t decide which I like best to include in my BJP challenge! What do you think – which one appeals most to you, and why? I welcome your thoughts if you care to drop me a line. Here’s a peep at my current project based on my love of tulips. I am enjoying the challenge of creating a lifelike image of these beautiful flowers. Unfortunately you only get to peep at the action – because the bossy Samera is laying down her advice! In the meantime I have completed my challenge for the Bead Journal Project and I will post this on my blog shortly. I am feeling somewhat cautious about showing my piece, because those produced by many members of this group are absolutely marvellous. Oh well, I have to start somewhere, don’t I? I am lucky to have supportive members – which helps a LOT. Why not come back in a couple of days and you will see what I mean. 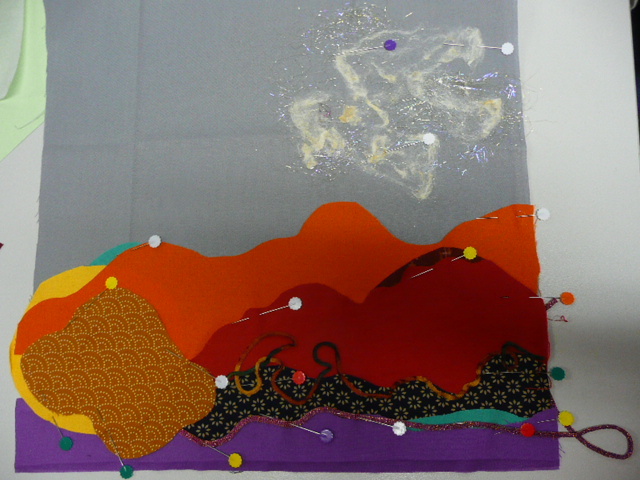 You are currently browsing the Crafty Quilting with Pamela blog archives for February, 2010.